Have you ever caught catfish on a crankbait? Or perhaps another kind of fish unexpectedly when fishing with artificial lures and baits? 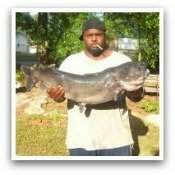 Most of us have heard of fellow fishermen catching catfish on artificial baits. 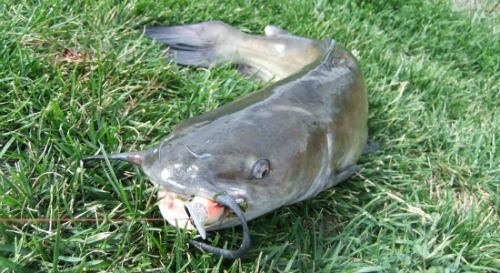 Some anglers will intentionally fish for cats with artificial lures, but most often it's by pure dumb accidental luck. Well, it's happened to me quite a few times. For instance, I've managed to catch a few carp on soft plastic worms. I've hooked into bluegills on plastic grubs and crankbaits while fishing for largemouth bass. And I just recently nailed a hungry channel catfish on a crankbait. Every year, my father-in-law's employer holds a company picnic at Micke Grove Park in Lodi, California. So, we all go and eat barbecue food, drink beer, play horseshoes, win prizes from the raffle, take the kids to ride the rides in the amusement area, check out the zoo, and just hang out. 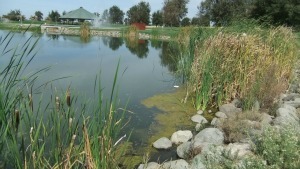 A new lake was created at the park back in 2008. I was thrilled when I learned there was fish being stocked in the lake. But, we weren't allowed do any fishing there at first. They wanted to give the fish a couple years or so to acclimate themselves. Finally, after a few years of waiting, I got my chance to test out the 3 acres of water of Wortley Lake during this years picnic gathering at Micke Grove. I had a shad colored crankbait tied on and began fishing on the South end of the lake. But with nearly every cast there would be grass on the hooks. I knew I should probably change my lure to something more weedless, but I didn't bring much tackle. So I just had to make due with what I had. Anyways, I worked my way up along the West side of the bank. I got to the bridge and took a cool breather in the shade. I made a cast diagonally out and across to the other side of the bank. Then Bang! I hooked into a 1 pound largemouth bass. Okay, so now I'm feeling better. At first I wasn't sure what to expect from this lake. I continued fishing around the north end. I made casts to a ton of key spots without much luck, including the current provided by a waterfall, along some rip rap, and around brush. Then I made a cast out past some tully bushes along the rocky shoreline, the same spot seen in the picture to the right. I began to slowly crank the reel handle to retrieve it back. Then I felt something hefty knock the snot out the lure. It pulled hard as it peeled off line while it headed out to deeper water. I assumed it was a big largemouth bass. As I worked the fish and got it in close enough to see it surface, I realized that it was not a bass. My digital scale would not turn on for some odd reason, but I estimated that this fished weighed around 5 1/2 to 6 pounds. To help give an better idea about the size of this catfish, you can see my foot next to the end of it's tail within the photo below. Catfish brought to the shoreline, length compared to my fresh white Nike shoe. All fish are catch and release only at Wortley Lake. The planted fish there are catfish, largemouth bass and bluegill.